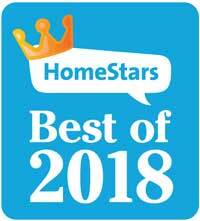 When it comes to deck building and installation, there is not a fixed solution for all homes. After all, each house has a different style. Each yard has a different size. And some people are on a tight budget. Although the price is often a concern, don’t let it get in the way. Cheap wood choices would require frequent maintenance over the years. And so you won’t avoid paying for it – not to mention the hassle. When it comes to composite decking, people are often under the impression that such choices are cheaper. And they can be inexpensive but with a price. 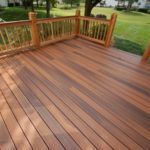 So let us check out together the advantages and disadvantages of wood and composite deck options before you decide which one seems to be the greatest choice for you. You can order wood custom decks from a variety of species. The most popular choices are ipe, cedar, and pressure treated wood. Each one has its benefits and drawbacks. 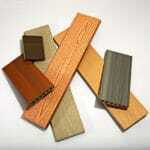 Take pressure treated decking for instance. It’s one of the most cost-effective deck solutions and can last for long. But a cheap option will never look good. It might also warp and shrink. Ipe outdoor decking is an excellent choice. If you can afford it. The good thing about it is its durability, longevity, and minimum maintenance requirements. Not to mention how beautiful it will look in any environment. So you save money in the long run and enjoy a hard wood for a very long time but you pay more today. What’s also important to consider is ipe deck construction. Since this is a hard wood, it’s not easy to work on. And so you must choose a specialized ipe deck builder. An average solution would be cedar outdoor decking. It’s a nice looking and fairly priced option, and can last for years with proper maintenance. Redwood cedar is resistant to moisture and hence rotting. Keep in mind that this is a soft wood and can be scratched easier by furniture. Also, remember that it might last for long but won’t look at its best a few years from now. In other words, you have to get rather expensive wood outdoor decking in order to keep it for long without having to stain or take care of it every now and then. But if you like the natural wood look, this is the choice for you. Nothing compares with the beauty of wood. Go for composite decking installation if you are interested in almost no maintenance options. 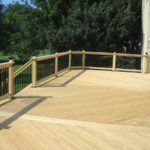 Since such decks are made of wood fibers and plastic, they are resistant to everything – scratches, rot, bugs, moisture, splintering or twisting. In other words, such decks can last for a long time and you will hardly bother with them. But they are not as beautiful as natural wood. If you choose dark colors, the deck will get very hot during the warm days. And you need to watch out for possible formaldehyde emissions. EPA recently published a rule for the avoidance of harmful exposure to such emissions. So if you want composite deck building, you still need to pay a higher price to get quality materials and thus remain safe. But you won’t spend any more money for your deck. So if future maintenance costs are your concern, choose composite decks.